Introduction Prostaglandins are integral components in the cellular response to inflammation, promoting cellular proliferation and angiogenesis. The enzyme responsible for the conversion of arachidonic acid to prostaglandins in response to inflammation is prostaglandin endoperoxide synthase 2/cyclo-oxygenase 2 (PTGS2/COX2). Polymorphisms in the PTGS2 gene have been associated with various diseases, including inflammatory bowel disease and cancer of the lung, colorectum, and breast. Methods We genotyped the five most common polymorphisms (rs20417, rs5277, rs20432, rs5275, and rs4648298) in the Nurses' Health Study (1,270 cases, 1,762 controls) to test the hypothesis that polymorphisms in PTGS2 are associated with breast cancer risk, using logistic regression analyses. The Nurses' Health Study 2 (317 cases, 634 controls) and Harvard Women's Health Study (702 cases, 703 controls) were used to further examine putative associations. 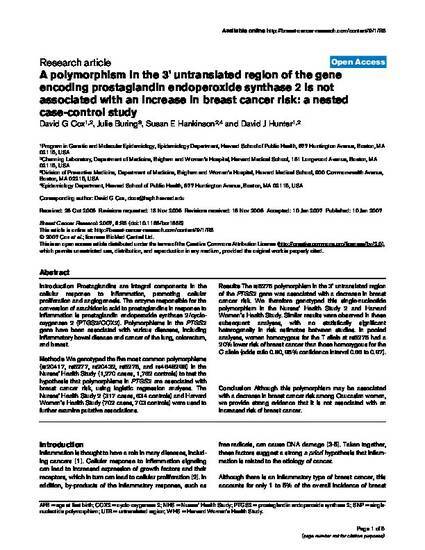 Results The rs5275 polymorphism in the 3' untranslated region of the PTGS2 gene was associated with a decrease in breast cancer risk. We therefore genotyped this single-nucleotide polymorphism in the Nurses' Health Study 2 and Harvard Women's Health Study. Similar results were observed in these subsequent analyses, with no statistically significant heterogeneity in risk estimates between studies. In pooled analyses, women homozygous for the T allele at rs5275 had a 20% lower risk of breast cancer than those homozygous for the C allele (odds ratio 0.80, 95% confidence interval 0.66 to 0.97). Conclusion Although this polymorphism may be associated with a decrease in breast cancer risk among Caucasian women, we provide strong evidence that it is not associated with an increased risk of breast cancer.